Exactly six monts after the original post, let me show you the latest Mauricio's creation. 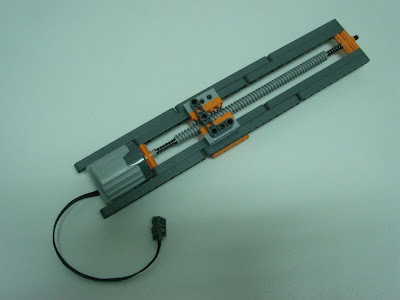 The finished design for his Linear Actuator (LA), made of discrete elements, is an evolution of the initial experiments shown on the original post. This would be better called a Track Actuator (TA) as he explained to me. Technically a TA consist of a moving "car", while LA features an expanding/contracting rod. 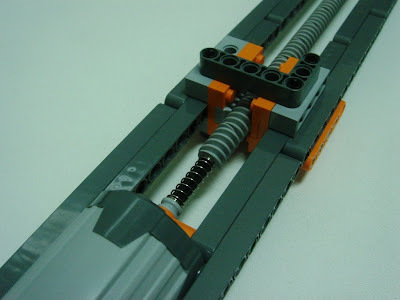 Nevertheless it would be easy to attach a rod (axle or bricks) to the moving "car", turning it into a LA too. According to Mauricio, this design was inspired on another LA design suggested by Alexandre (AVCampos), that was also shown before here at TBs on the same original post (the render on the post's top image). Beauty and ingenious this idea, on how the stop points problem at each LA end was solved, to force the "car" returning automatically on track after the motor direction is reversed. No need for the LEGO clutch or switches. The springs make a nice work freeing the motor from any kind of extra effort or overload and allowing the "car" back in movement after the motor direction is changed. We have discussed small problems on the original prototype reliability, which got also a very simple and effective solution. In the end a small touch with a few orange parts to make it in the spirit and hype of the current PF elements (who the hell, gave this Orange ideia...?). 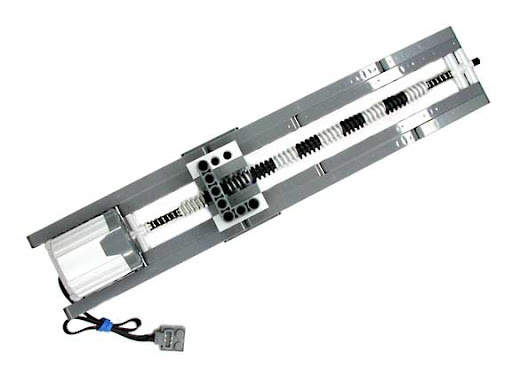 It may be of use in some specific applications, specially because it works very well. But I agree with you. It is really big!! Anyway it worths for the principles applied. Yes, it may be too large for the scale of applications usually associated with pneumatics or dedicated LA's, but what if you want it BIG? The first example that pops into my mind is a big legged robot. Conventional pieces would be too short to actuate it, so this extra-long assembly would be much better. There are some very large excavators on Brickshelf* which mostly use strings to operate. This LA design could come in handy for them. strings are used to operate these large models for the very same reason why large cables are used in real life. And that would be to reduce the amount of work and energy required to lift heavy objects, and to reduce the amount of energy and work required to make the crane operate its functions. I'm not saying that these LA's in this post don't have a use, its just a verrrrrrry specific use that doesn't really warrant the need to sell these things as a mini kit. Those springs were taken from 'Technic, Shock Absorbers 6.5L with Normal Spring'. cool experiment. When is Ilegos going to release the rubber feet for the new tracks? Those tracks would be fantastic if they had better traction.